Following a string of well received international dates throughout 2011 and the most recent UK concerts at The Lowry, Salford, Peter Hook And The Light have announced a UK tour for May and June 2012, visiting a number of cities for the first time to perform Joy Division’s debut album ‘Unknown Pleasures’ and returning to London for their second ever concert in the capital, playing ‘Closer’. Beginning in Liverpool, the tour sees Hooky And The Light play their second ever Scottish gig in Glasgow before returning to England with dates in Nottingham, Sheffield, Birmingham and Oxford - all of which are ‘Unknown Pleasures’ concerts.Whereas, the London date sees the first ever ‘Closer’ concert in the city. 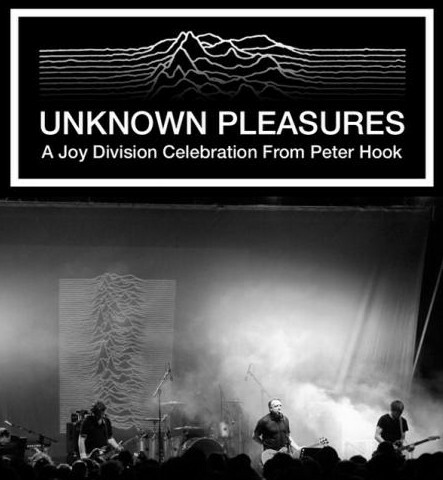 In the only North West date for Peter Hook And The Light presently confirmed for 2012, the band are to play ‘Unknown Pleasures’ and ‘Closer’ in the same evening at Buxton Opera House on Saturday 25 February 2012. Playing the albums sequentially and in track order, both Martin Hannett produced LPs are considered seminal, much loved classics and their influence remains pervasive today, both with fans and for the many bands, influenced by and who have taken on the template of Joy Division’s sound in the modern era. ‘Unknown Pleasures’ is considered one of the most stunning debut albums ever released and “still powerful enough to floor you 30 years on” (NME), while on ‘Closer’, Hannett’s incandescent production permeates the record alongside a band that had grown much in confidence approaching their second album. Both albums have come to yield many landmark tracks, ‘Unknown Pleasures’ with ‘Disorder’, ‘Insight’, ‘New Dawn Fades’ and ‘She’s Lost Control’, while ‘Closer’ counts ‘Atrocity Exhibition’, ‘Heart And Soul’ and ‘Twenty Four Hours’ amongst its many highlights.